It arrived with a bang, which in New England meant it snowed for around 24 hours. It was heavy, it was wet, but the temps got a little warmer, the sun came out and some of it is melting. We still have a couple of piles that are over 4′ tall, but I’ll take all the melting I can get before the next storm comes tomorrow. Last Friday, I went to the UNH Greenhouse and enjoyed seeing the beautiful green plants, smelling the Hyacinths, seeing the water features, and came home with several plants. Buying plants this time of year probably wasn’t the smartest thing I’ve ever done, but I sure had fun. There I was holding my cardboard box and picking up plants. But, before they made it to the box, I checked them all to see if by any chance there was more than one plant in the pot. Do you do that? I always do that. In most cases I can find one pot that somehow two seeds got dropped into, and when I get home, I can divide and have two plants. I wanted a Cinnamon Curls Heuchera, but they weren’t for sale. So, I saw a hanging basket that had two of them in it plus two other plants for only $4 more and all of the money went to the Future Farmers. Bought that one with a smile. Now I’ll have four plants, 2 annuals and 2 perennials, for the low price of $14. Sweet Caroline and Tri Color Sweet Potato Vine plants both have two plants in each pot. While I wait to get outside and start on my long lists of chores, I’ve been working on a couple of small projects. I finished my first wool penny rug thanks to the help of my friend, Sue, and completed a pansy wall quilt. Next, I will be appliquéing fifteen aprons to be worn at the Master Gardener plant sale next month. Today is errand day. Among other things, I have to try to convince a customer service rep to take back a Canon printer that croaked after only three weeks, but I don’t have the box. What do you think my odds are? 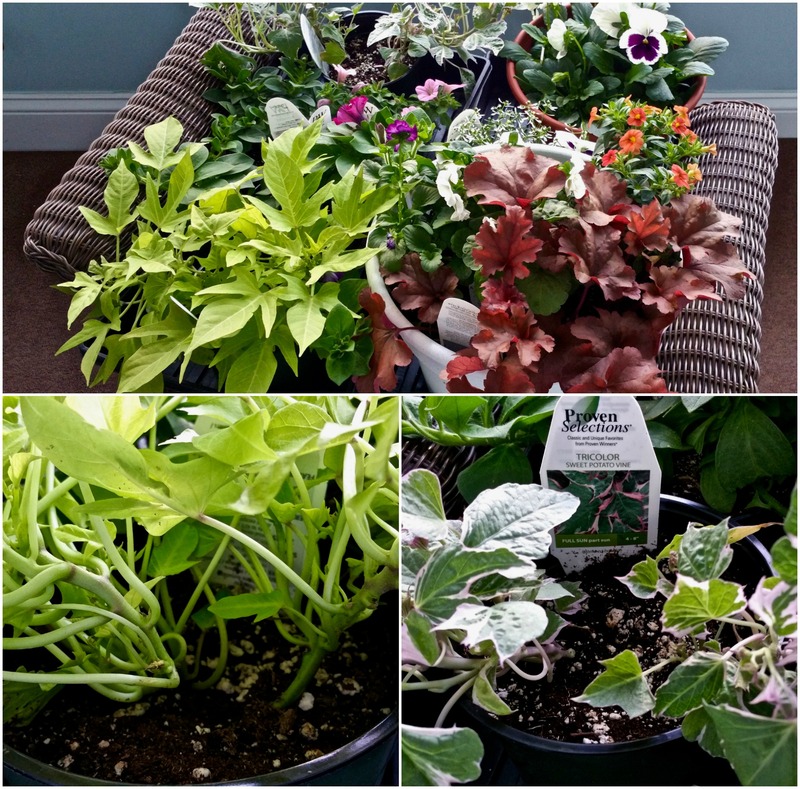 This entry was posted in Gardening, Quilting and tagged Cinnamon Curls Huerchera, Gardening, New Hampshire, Pansies, Penny rugs, Quilting, Spring snow, Sweet Potato Vine, UNH greenhouse. Bookmark the permalink. I came here to see the cardinal project, not hear about the weather! 🙂 I am SO over snow! But, wow – not disappointed! I see you have added a new skill to your inventory. The rug is just perfect – and “sew” is your pansy! Lovely touches of bright color in your beautiful, tasteful home. So, perhaps you bought plants a bit earlier than normal – at least they will eventually be planted! – unlike the fabric I keep buying that will likely never see itself within a quilt! That’s pretty clever – checking each pod for a freebie! I have had that happen accidentally with my annual purchase of impatiens, but from now on I’ll check before I buy! Happy spring, Judy! You are SO ready for it! You noticed, I didn’t take any photos of that snow or those snow banks because I refuse to acknowledge it. 🙂 You’ll be surprised once you start looking how many double plants you might find for yourself. All you need to do at home, is cut it so each plant has enough roots to survive. Pretty easy. For ones without specific tools, a steak or paring knife works just fine. Take your time and give those plants a good twice over to find the double bargains. I bet you LOVE that new grass bed because it is right where you want it to be. 🙂 You’re spurring me on. I’ve been looking out the windows and making note of what I can enjoy and what I can’t. Now if the weather would just cooperate, I’d get out there and get busy. 🙂 Happy creating while the rain waters your new grass. Then again, I am ready for Opening Day and to start putting March farther and farther into the rear view mirror. Oh, that pansy and cardinal! Then there are the aprons you are making. (Fifteen?) So heartening to read of such creativity. Take that, April snow! As for me, busy, busy, busy with my YA fantasy “Maya and the Book of Everything.” Still getting the word out. Hopefully, you’ve had the last snow and can now move into spring. Thankfully, most of the pollen is gone from Houston now and we can enjoy these wonderful days. Whenever I see the word, Houston, much loved family comes to mind and many trips to Galveston. Glad the pollen is gone and you are enjoying nice weather. You made out well with your purchases, a veritable bargain judging from the prices in catalogs, which I find outrageous. Thankfully, we have good-quality and -priced, local vendors, so I can wait. Your pansy quiltpiece is lovely – I hope you post a photo of your aprons! How’d the printer return go? I will post the aprons when I get them done. 🙂 The printer return went okay. They had me go find a new one in a box in the store so they could compare it to the one I returned and confirm the numbers on my receipt. Bottom line – I got the refund. And, you can be sure the box for the new one is going immediately to the attic. Glad the return went smoothly. My spouse ridicules my holding onto boxes, but your case proves it is a good idea, at least for 30 days. I”m reading Hannah Coulter by Wendell Berry, doing spring cleaning, and taking walks around our neighborhood as it’s in the 60s today! Judy, I still always think about my father’s war stories. I see Judy you’re very experienced in buying flowers – you choose more seedlings in a one pot, I should do the same 🙂 Your cart is full of flowers, nice choice. Loved your new works, especially Daises. Sure your aprons are pretty! Nice plant choices 🙂 Bright and happy stuff! My first week of April will be busy at work, but slower at home. I must shop for vittles no later than tomorrow night, but I am tempted to do it tonight just to get it done! I have the meats and cheeses done, at least. My first days of April? Just got back from the California trip on Thursday, so I’m still settling in: errands, cleaning, cooking, just made granola…that sort of thing. What I hate most about vacation is once I’m back, it seems as if I never went. 🙂 I did have a massage today, which was delightful! If I could afford it, I’d get one every week (or every other week.) This was a much-delayed part of my birthday present. After the remnants of Cyclone Debbie passed over us, dropping more than 150 mm of much needed rain, our garden is green again and my roses are covered in new growth. Your new creations are lovely, Judy. I really like the pansy. A cyclone is the same as a hurricane and a typhoon. They have different names depending on where they are. Cyclone is the name used in the South Pacific. Our garden is looking nice now. The hardiest of our spring flowers are up, a couple of inches anyway. It was nice yesterday and today, but tomorrow, back to snow and sleet. The process of making spring in New England is a classic two forward, one-and-a-half backward thing. We’ll get there. Eventually. I hope we do it before the caterpillars. I’m disappointed that I couldn’t get over to UNH on Saturday and I’m green with envy over your plants. 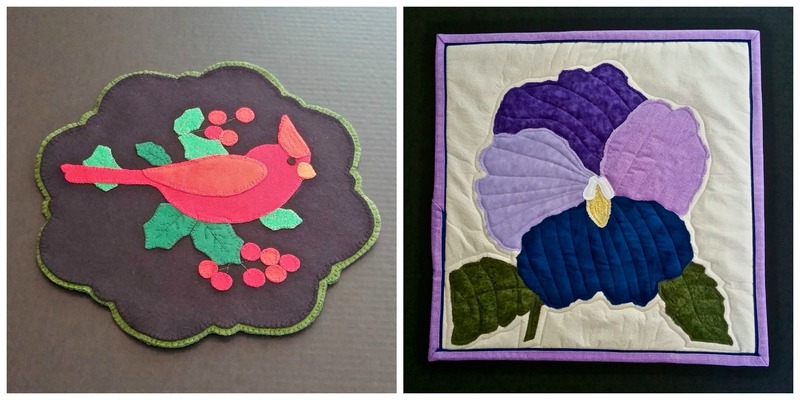 Love your new creations and you’re making15 appliquéd master gardener aprons in a month….? Wow! Love the penny quilt and wall hanging. And the cart of flowers. I too look for an extra plant in the pot! Can’t wait to see those aprons. What a nice thing to do. I’m guessing this latest round of rain should remove the remainder of your snow. It’s really worn out its welcome. Like bad company that never knows when to call it an evening and go home!! Love your quilt and walling hanging, and I’m faint hearted at the thought of sewing 15 aprons! Good to see the snow hasn’t dampened your gardening spirits, and I hope to see them all re-potted and blooming in a future post! Oh, yes, I check and try to get that extra plant! Any time I buy plants of any kind. Love your penny rug…I have always meant to make one but never have. And that pansy is beautiful. Amazing projects! You amaze me! Hope your snow disappears quickly. In the U.K. We have had such a mild winter that not a single snowflake has fell on our garden. Your art work is beautiful Judy. As always, I am in awe of your sewing genius. Your fabric creations give me a good idea of how artful your gardens must be. What is a “penny rug”? Surely no one walks on that!! It’s such a pleasure to see beautiful handmade things like those. Also a pleasure to see those plants. A much-needed reminder of what will be. Thanks! The word “craft” can be so misleading. It truly means so much more than people realize. Thank you for this history — I had no idea. You do such awesome things! The penny rug is wonderful! The women in my sewing group are heavily into wool applique but I haven’t tried it (no new hobbies!!) And I love heuchera, too–all the colors and styles. Some of them grow so well for me and others just don’t–not sure why! It was lovely here yesterday and I finally got to spend the day outside, cleaning out birdboxes, cleaning up perennial beds, and cleaning out my beehive. Still quite a lot of snow and frozen ground, but there are some crocuses and hyacinths peeking up. Finally. Well, maybe not finally–more snow today?!? We got lucky. As the snow heads your way, we are receiving rain so I can actually see patches of brown muddy ground – beautiful. 🙂 Are you going to have to order new bees this year? Yes. The bees will be here later in April. I can’t wait to get them in, but we need the maples and crocuses to get going so the bees will have some forage! You would be so proud of me! I got my tomatoes planted on Saturday along with a butterfly weed, some sunflower and milkweed seeds, too! I also got my plumerias trimmed so I will have 3 more to pot next weekend! Right now the plumerias all have baby leaves sticking straight up reaching for the sun. It is one of my favorite things about spring. Have a great week! You got a good deal on the plants. Your aprons are going to be beautiful! Good attitude – never surrender! You’ll outlast winter in the end. I always check the pots of plants I am buying to see if I can get a 2fer. Many times, my diligence pays off. Which is great if I happen to neglect one to the point of it’s demise. Not to worry, I will over water the other one.